The fine weather is still with us, but the hordes have disappeared – so now is the time to visit Victoria’s magnificent coastline, especially with the kids in tow. Victorians have always known the summer holidays are scheduled months too early. Melbourne’s famed “four seasons in one day” weather extends across the whole state at the beginning of summer, and things don’t really settle down until around now, when we can rely on a few 40-degree-plus days, followed by more pleasant 30-35-degree temps in March and through early April. No doubt about it – this is the best time to be heading for a family sojourn on the shores of the Southern Ocean. But where? I consider myself qualified to make suggestions. I’ve dragged my daughter to numerous test locations for child-friendly holidays, and this means places where parents get a bit of pleasure too. Some of these recommended haunts are well-known, some less so, but all have been picked because they’re stacked with accommodation options, especially for families. Some of the more famed resorts – Lorne, Anglesea, Barwon Heads, Queenscliff, Sorrento, Portsea – are not in my own experience as family-friendly, so they haven’t made the cut. I’ve got a feeling this town is underrated by tourists. Victoria’s first real colonial settlement was established here in 1834 by the Henty brothers. There’s plenty of history in town, but the vintage cable tram along the foreshore (get on/off at any stop) is bound to be a hit with kids, especially climbing to the lookout atop an old water tower at the far end. The tram terminus has a small but interesting museum and is a short walk from the Botanic Gardens. Battery Point’s restored 1889 cannons are worth a visit, as is the fishing fleet in the harbour, but the Powerhouse car museum in Glenelg Street (open daily) is – I hate to discriminate – probably more interesting to one gender than the other. Good fishing from the harbour breakwater, but the aluminium smelter tour should be strictly for a rainy day, even though it’s free. Bentinck Street, which runs along the foreshore, has a swathe of lush green gardens to seaward and a line of shops on the other – there are a couple of good cafes for brekky or lunch, or you can get takeaways and picnic in the gardens. Local horse riding ( 5529 2303) is available, plus canoeing, caving and biking trips ( 5523 3175). Cape Nelson lightstation is, disappointingly, closed at time of writing. The local beaches are fine – but do, at some stage, venture 20km out of town to Cape Bridgewater. A wide arc of sand fringes potentially great surf for board riders, but swimmers should stay between the flags. There are walks along the towering headland to the Petrified Forest; a Blowhole (tide and weather permitting); and the seal watching tour ( 5526 7247) by boat, in spite of the fishy stink, is worthwhile. A small cafe abuts the beach, and that’s about it for eats. Several motels on Henty Hwy and Percy Street – try Victoria Lodge Motor Inn (two apartments available), or Bentinck Hotel near the foreshore; Clock by the Bay ( 5523 4777); historic Burswood Homestead ( 5523 4686); and Lorelei B&B ( 5523 4466). Sea View Lodge at Cape Bridgewater ( 5526 7276) has some self-contained accommodation. Narrawong Holiday Park, ten minutes from town, and Centenary Caravan Park both have cabins. Try Pino’s in Gawler street, an Italian-style eatery with good pizza and pasta, or Port of Call in Bentinck Street. Most of the pubs do pretty good bistro meals. Portland is 360km west of Melbourne on Princes Hwy. Allow 4.5hrs easy drive if you’re on that haul. For kids, break the journey at Colac: there’s a playground in the memorial gardens in the centre of town, Botanic gardens and cafe by Lake Colac. Quite a sizeable town with plenty of shops, but most of the interesting stuff is located on the southern edge beside Lake Pertobe, Lady Bay and the Merri River mouth. Wrong season for whale spotting at Logan’s Beach, though. Flagstaff Hill Maritime Museum (family entry $35) is well worth a visit – it has themed displays and a replicated colonial coastal port. The best thing is the two-day unlimited entry ticket; kids will enjoy exploring but they’ll learn more if some explanation is forthcoming and it’s taken in smaller chunks. During holidays there are craft-making activities, while at dusk a “Shipwrecked” light and sound show (family $62.50) interests school-age kids; cafe, tearooms are open daily. A penguin colony lives on Middle Island at the Merri River mouth, but beware tides and water conditions – people have drowned here recently. Warrnambool is close to the Twelve Apostles and Loch Ard Gorge, so perhaps try a helicopter (expensive) or light plane flight (cheaper) for bird’s eye viewing. It’s also an easy day trip by car, as are volcanic Tower Hill and Port Fairy. Plenty of motels in town, but many of them far from the action and not great for kids. Spend a bit extra for an apartment, especially closer to the water; try Cannon Hill Apartments ( 5561 14890), Port Warrnambool Village (two and three bedroom apts,  5562 4990), Olde Maritime Motor Inn (two bedroom apts,  5561 1415), Lady Bay Apartments. No shortage of holiday villages – Ocean Beach (1800 808 130), Figtree ( 5561 1233), Warrnambool Holiday (1800 650 441) all have ensuite cabins. Merton Manor B&B ( 5562 0720) is ideal for couples. City Memorial Bowls Club is family-friendly for dinners, Breakers (Banyan Street) for seafood, Pippies by the Bay at Flagstaff Hill, Macey’s Bistro, and any number of pizza and take-away places. 260km west of Melbourne on Princes Hwy, three hours’ drive. Colac is the place for a break, or take the Great Ocean Road for a six-hour scenic tour. For decades this hamlet slept as Apostles visitors passed by. Not any more. Now there are a few good places to stay and good eateries to complement the scenery. Port Campbell is the only boat shelter in these parts, and not a good one at that. But when summer storms pound the rugged coast it’s even more beautiful. The main street has had a major revamp and there are some very good, trendy eateries like Waves, and good accommodation. To be honest, there’s not a lot to do in town other than make it a base for short tours along the coast and hinterland. Timboon (for cheeses) and Camperdown make good day trips. The beach can be dangerous for swimming, but anglers can get a bite and surfers a wave. Heaps of walks, shipwreck history, Glenample Homestead, helicopter scenic flights and beachcombing. For couples: Waves ( 5598 6111), Portside Motel ( 5598 6084), Shearwater Haven B&B ( 5598 6532), Sea Foam villas ( 5598 6413, fold-out child bed). For families: Daysy Hill Cottages ( 5598 6226), Eastern Reef Cottages ( 5598 6561), Southern Ocean Villas ( 5598 4200), Port Campbell caravan park & cabins (choose carefully – some are close to the street). Waves, in the main street, is tops in the region, open for breakfast, lunch and dinner. Splash for seafood, Bombora Beach Bar and 28 Cafe all do sit-down meals, then there’s a few takeaways and a bakery. Inland route from Melbourne via Colac and Cobden takes about four hours, Great Ocean Road about five and a half. Break at Colac or Apollo Bay. View of a wharf near the Sea Foam Villas at Port Campbell, Victoria. 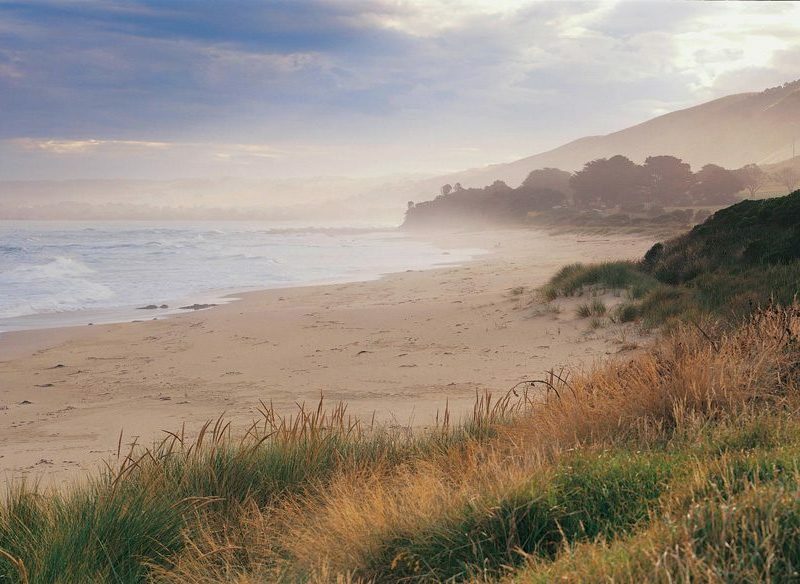 Apollo Bay has had a makeover. Thankfully there are a few good places to stay and eat – but while the scenery was always good the infrastructure was deplorable, until recently. In town there’s a strip of shops one side, beach the other, with a belt of greenery and a golf course close to the pretty harbour. Fishing’s the go here, perhaps a swim, two little museums, and the town’s Saturday market. Head off to the Otway Fly treetop walk, Cape Otway lightstation, waterfalls and forest walks, platypus tours and horse riding. For couples: Chocolate Gannets (0500 500 139), Captains at the Bay ( 5237 6771). For families, Great Ocean Road Beachhouses ( 5237 7850), Rayville Boathouses ( 5237 6381), Beachcomber (apts,  5237 6290), Kooringal Holiday Park & cabins ( 5237 7111). The Bay Leaf Cafe for good deli style, La Bimba, Sea Grape Grill, hotel, takeaways. Catch of the day from fisherman’s co-op at the harbour. About 3.5hrs from Melbourne on Princes Hwy and Great Ocean Road. If towns along Victoria’s west coast have endured a sea change in the past ten years, then the same has hit Inverloch in the past five. Because it’s under two hours from the city, and on the coast, it had to happen. Real estate has gone through the roof and regularly nudges the magic mill, yet somehow the town has been enhanced rather than spoiled. You can get a good coffee for one thing, and the bakeries have real cream in their cakes. Anderson Inlet is good for fishing, swimming, sailing and windsurfing. Inverloch is pleasant, crowded in holiday season, but again it’s just a base for nearby attractions such as the Bunurong Marine Reserve – the road to Cape Paterson has cliffs and sandy coves, and rock formations similar in some ways to The Apostles; Wonthaggi has the State Coal Mine, mostly open for inspection; Cape Liptrap a lighthouse and wonderful views; Walkerville has historic lime kilns and a tiny beach. Phillip Island is an easy day trip. The Reefs apartments ( 5674 2255), Beachside @ Inverloch ( 5674 3622), Inverloch Holiday Park & Cabins ( 5674 1447). Cottages or apartments are the go here, so ring the info centre. Esplanade Hotel, Cafe Tsunami, The Kiosk, bakeries. About two hours’ drive from Melbourne on South Gippsland/Bass Hwy. For most of the year this is one of Australia’s sleepiest ports. It’s pretty, tranquil and relaxing. At Christmas and Easter it buzzes with holidaymakers – most of whom are into fishing. You’ve gotta be, because the place practically eats, talks and lives fish for its existence. Port waters are sheltered by alternating shallows, islands and deep channels, part of the Nooramunga Marine and Wildlife Reserve. The wharf has a fishing co-op and a fish ’n’ chip shop, and the nearby pub nets locals after a day of, well, fishing. Bring your boat, or sit on the wharf with a rod. Pub too crowded? General store bursting at the seams? Fish not biting? Head for Tarra Bulga rainforest walks, tour Grand Ridge Road, local beaches (none in Port Albert), a pie at Yarram. Port Albert also has a very good maritime museum. Port Albert B&B ( 5183 2525) is probably the best in town for couples. The local pub ( 5183 2212) has several four-bed motel rooms which are okay; Seabank caravan park & cabins ( 5183 2315); Port Albert caravan park & cabins ( 5183 2600). Motels in Yarram. Port Albert pub has a big dining room and serves surprisingly good meals, especially the local fish. Fish ’n’ chips on the wharf, general store . . . that’s about it unless you drive 14km to Yarram. 2.5hr drive from Melbourne on South Gippsland Hwy. A decent break at Coal Creek historical park in Korumburra will keep the kids amused. At Toora see the wind farm: according to Dave Berry, administration officer for the farm, it generates enough power annually for 6,600 homes. The power is transmitted into the national power grid at Toora and is used by South Gippsland industry, business and communities. Kudos. Mallacoota is a long drive from Melbourne – too long for kids in one go unless you take a couple of breaks. The eastern border of Victoria/NSW is marked by a cairn on the beach at Cape Howe. Hardy bushwalkers take a beach trek from Mallacoota township, a day’s effort to pause at the border before continuing north for another two days laden with food, water and sandflies. The easy way is to charter a light plane from Mallacoota airport. Other walkers might consider the challenges of the Croajingolong National Park, but for the rest of us it’s the last Victorian outpost, and a pretty one at that. Wildlife abounds, with dozens of native birds and endemic flowers, great fishing in surf, inlets and rivers, short easy bushwalks, tours to Gabo Island and its penguins (Parks Victoria Mallacoota office phone  5161 9500, lighthouse keeper’s cottage available). Many options, including Adobe holiday flats ( 5158 0329), Mallacoota Court ( 5158 0508), Beachcomber caravan park & cabins ( 5158 0233). Stay at nearby Gipsy Point if you like fishing – Gipsy Point Lodge ( 5158 8205) or Gipsy Point Lakeside ( 5158 8200). At Gipsy Point Lodge all meals are provided. In Mallacoota there are few options – Croajingolong Cafe, The Tide, Cafe 54. Expect to self-cater sometimes. 540km from Melbourne, about seven hours’ drive. Overnight at Lakes Entrance is an option. There’s only limited cottage lodging at the lightstations that dot Victoria’s coastline, but they’re worth mentioning because they’re in the most scenic places of all. You could go to Gabo Island, a plane flight from Mallacoota, and take all your own gear – no shops here. It’s wild, basic and remote, with plenty of seashore to explore, penguins, maybe a resting seal, and beachcombing after storms. Point Hicks ( 5158 4268) is similar, but nearly an hour by car drive from Cann River in east Gippsland: self-catering, BYO everything. Otway lighthouse was built from sandstone in 1848, the oldest surviving beacon of its type in Australia. The Cape was the main landfall for the northwestern approach to Bass Strait and in early colonial days. With feet firmly planted on terra firma, storm-tossed Bass Strait is an incredible sight. There’s comfortable accommodation in upgraded keepers’ cottages. Self-catering, breakfast is available, the lightstation cafe is open from 9am each day (dinner by arrangement), and lighthouse tour is included. Phone (03) 5237 9240. Internet www.lightstation.com.